The History, English, and Theology, Religion and Philosophy Departments have a full programme this year at the Leeds International Medieval Congress in July 2019, with eleven medievalists speaking in multiple sessions, plus two more moderating and attending. The Centre for Medieval and Renaissance Research https://www.winchester.ac.uk/research/exploring-the-past-and-the-world-around-us/centre-for-medieval-and-renaissance-research/ also takes centre stage, sponsoring two sessions at Leeds in its first year as a research centre. 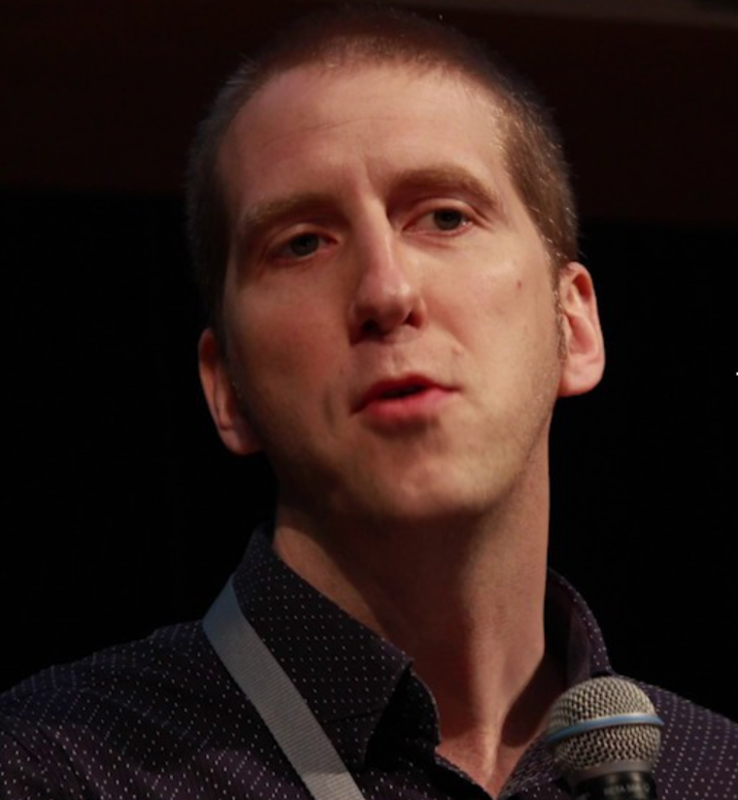 Dr Rob Houghton of the History Department is very busy this year at Leeds, and he hits the ground running in the first sessions of the conference starting a strand on ‘Games for Teaching, Impact and Research,’ sponsored by The Public Medievalist where Rob is an editor https://www.publicmedievalist.com/. This first session features papers from James Neel (Arizona State University), David DeVine (Arizona State University) and Antonio César Moreno Cantano (Universidad Complutense de Madrid). In the same session slot, recent History MA graduate Emer. Prof. Tom Watson will be presenting his Master’s research in a paper titled ‘An Examination of the Factors that Prolonged the Cults of Anglo-Saxon Saints to the 16th Century’ in session 138 alongside Agon Rrezja (Institute of National History, Skopje) and Anna Gusakova (Lomonosov Moscow State University). Also in the same scheduled time, Dr Katherine Weikert of the History Department will be participating in a Round Table session 140, organised and moderated by Daniel Brown (Köln) titled ‘The Materialities of Medieval Studies.’ The panel will include Dr Mateusz Fafinski (Freie Universität Berlin), Dr James Michael Harland (Eberhard-Karls-Universität-Tübingen) Dr Dolores Jørgensen (Universitetet I Stavanger), and Johannes Waldschütz (Stadtmuseum und Archiv, Stockach). Dr Rob Houghton continues his organised strand on ‘Games for Teaching, Impact and Research’ in session 246 with Winchester History’s Dr Matthew Bennett presenting a paper titled ‘Recreating Conquests: 1016 and 1066 as Decision-Making Games.’ This session will also include papers from Prof. Owen Gottlieb (Rochester Institute of Technology, New York) and Dr Juan Hiriart (Salford), and is moderated by Dr Katherine J. Lewis (Huddersfield). In the same session slot, Dr Katherine Weikert is this time presenting a research paper in Session 236, titled ‘Reconstituting the Middle Ages: Using Medieval Sources to Recover the Material Past II – Working with Inventories,’ organised by Dr Laura Cleaver (Trinity College Dublin) and Prof. Kate Gerry (Bowdoin College, Brunswick.) Katherine’s paper is titled ‘Things Forgotten: The Inventories of the Liber Eliensis.’ This session includes papers from Dr Judith Collard (University of Otago, New Zealand) and Prof. Marian Bleeke (Cleveland State University, Ohio). Dr Rob Houghton’s ‘Games for Teaching, Impact and Research’ continues, with Rob presenting a research paper in this session titled ‘Beyond Education and Impact: Games as Research Tools and Outputs.’ This session includes papers from Dr Mariana Lopez (York) and Dr Laura Harrison (Edinburgh), with moderator Dr Victoria Cooper (Leeds). Dr Katherine Weikert has organised, and will be a respondent to, a panel titled ‘Object, Memory, History’, focusing on the research ideas of her 2018-19 University Early Career Research Fellowship project. This session, 331, is also sponsored by the University’s Centre for Medieval and Renaissance Research. Prof. Bjorn Weiler (Aberystwyth) will chair papers from Dr Karl Kinsella (Oxford), Dr Jonathan Turnock (Durham), and Prof. Laura Gathagan (State University of New York Cortland). Dr Katherine Weikert ends her Monday sessions in a Round Table, session 429, organised by Dr Martyn Lawrence of the Royal Armouries, Leeds, titled ‘Repositories of Ingenious Inventions: How can Academics, Curators and Archivists Work Together More Effectively?’ This Round Table includes Prof. Oliver Creighton (Exeter), Prof. Kelly DeVries (Loyola University Maryland), Dr Paul Dryburgh (The National Archives), Dr Sophie Harwood (Humboldt-Universität Berlin), and Malcolm Mercer (Royal Armouries Leeds). Katherine is chairing two further panels throughout the conference on ‘Living in a Material World: Materiality and Monasticism‘, Session 632, Tuesday 1115-1245, and ‘Inside and Outside the European Castle’, Session 1305 on Wednesday, 3 July, 1630-1800. Dr Carey Fleiner of the History Department will be speaking in Session 512, exploring her Carolingian roots (or slumming it with the medievalists, she says as a Classicist) in ‘Using and Not Using the Past in the Transformation of the Carolingian World I: Negotiating Carolingian Identities, c. 800-900,’ organised by Dr Alice Hicklin (Freie Universität Berlin) and moderated by Dr Charles West (Sheffield). Carey’s paper is based in her research for a book under contract with Liverpool University Press, and is titled ‘Humour in the Work of Ermoldus Nigellus: A 9th-Century Carolingian Poet.’ Carey will be speaking alongside Dr Cinzia Grifoni (Österreichische Akademie der Wissenschaften, Wien), Prof. Eric J. Goldberg (Massachusetts Institute of Technology) and Prof. Maximilian Diesenberger (Österreichische Akademie der Wissenschaften, Wien). 1. 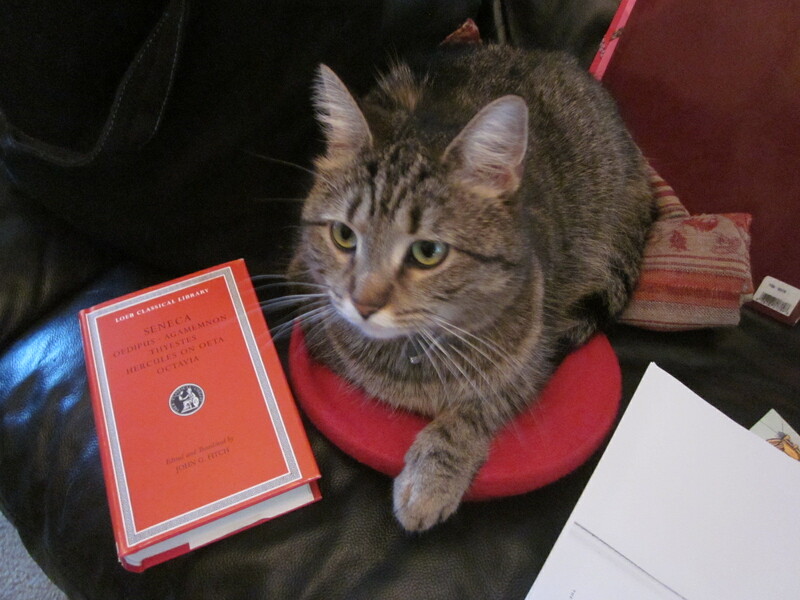 The Beans contemplates Seneca as a crucial part of Dr Carey Fleiner’s research process. Dr Rob Houghton of History continues his busy, busy Leeds, organising a second strand called ‘Playing the Middle Ages’ featuring throughout Tuesday. These sessions are also sponsored by The Public Medievalist. Rob will be chairing this session, 546, which includes a paper from Winchester History PhD student John Hopley titled ‘Historical Culture and National Identity within Assassin’s Creed.’ Further research papers will be from Dr Victoria Cooper (Leeds) and Laura Castro Royo (St Andrews). 2. Dr Rob Houghton speaking at The Interactive Pasts Conference in 2018. Dr Gordon McKelvie of the History Department will be speaking in Session 606 as a part of the History of Parliament Trust https://www.historyofparliamentonline.org/ celebration of the completion of its volume covering 1422 to 1461. This session, ‘The Late Medieval English Parliament II,’ is organised by Dr Hannes Kleineke (History of Parliament Trust, London) and moderated by Dr Linda S. Clarke (History of Parliament Trust, London.) Gordon will be speaking alongside Dr Sean Cunningham (The National Archives) and Dr Simon Payling (History of Parliament Trust, London). Gordon is also chairing two additional sessions throughout the conference, in ‘England and Scotland at Peace and at War in the Later Middle Ages II’, Session 207, Monday, 1 July, 1415-1545, and ‘New Approaches to Medieval Anglo-Jewry I: The Governmental Sources’, Session 1018, Wednesday, 3 July, 0900-1030. Dr Rob Houghton’s strand ‘Playing the Middle Ages’ continues with Session 646, with papers from I. Medel, E. Pillet and S. McPhaul, moderated by Dr Simon Trafford. Dr Cindy Wood of the History Department has organised Session 842, ‘Medieval Masons,’ which will also see her speaking on her ongoing research on Winchester Cathedral with a paper titled, ‘William Vertue, Master Mason, and His Self-Portraits in Stone.’ This session also features Dr Lucy Wrapson (Cambridge) and Dr Jenny Alexander (Warwick), and will be moderated by Winchester History’s Dr James Ross. This session is sponsored by the University’s Centre for Medieval and Renaissance Research. 3. 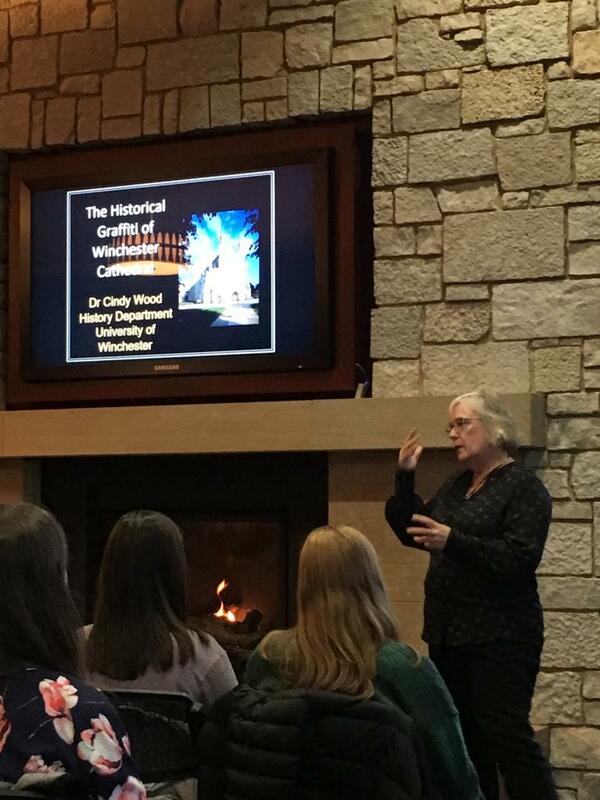 Dr Cindy Wood presents her research at the University of Wisconsin-Eau Claire in 2018. Dr Rob Houghton’s strand ‘Playing the Middle Ages’ continues with Session 746, with papers from M. Mindrebø, A. Bierstedt and J.M. Rubio, moderated by James Hill. Dr Rob Houghton’s strand on ‘Playing the Middle Ages’ closes with this round table featuring Dr Victoria Cooper (Leeds), Dr Katherine J. Lewis (Huddersfield), Dr Simon Trafford (London), and Rob himself. In this session, Dr Eric Lacey of the English Department is presenting a paper on the natural world and sensory perception in early medieval society, focusing around his research on birds. 4. Dr Eric Lacey speaking at the Early Medieval Power and Faith Symposium in 2018. Dr Rob Houghton will close out his busy Leeds in this ‘lightening-round’ Round Table on ‘Brevia on Bishops and the Secular Clergy in the Middle Ages, organised by Dr Evan Gatti (Elon University, North Carolina) and sponsored by EPISCOPUS: The Society for the Study of Bishops and Secular Clergy in the Middle Ages. Rob will be speaking alongside Aneilya Barnes (Coastal Carolina University), Jae-keong Chang (Edinburgh), Sigrid Danielson (Grand Valley State University, Michigan), Paweł Figurski (Uniwersytet Warszawski) and Pippa Salonius (Monash University, Victoria). Dr Toni Griffiths of History and TRP features in Session 1721, ‘New Approaches to Medieval Anglo-Jewry III: Remembering the Jews of Medieval England,’ organised by Dean Irwin and moderated by Prof. Louise Wilkinson, both of Canterbury Christchurch University. Toni will present a paper titled ‘Bristol’s Medieval Jews and 33 Jacobs Well Road: The Jewish Equivalent to ‘Tutankhamen’s Tomb’ or Simply an Abandoned Bet Tohorah?’ The overall session sees Toni speaking alongside Prof. Anthony Bale (Birkbeck, University of London), and Esther Robinson-Wild (York). Although not speaking this year, Prof. Emeritus Michael Hicks will be out and around at Leeds as well, enjoying the papers and the conference. Fortunately, the BBC staff worked hard to reassure the guests (Dr Katherine Lewis at Huddersfield, Dr Joana Laynesmith at Reading and myself), and, as they said it would, once you are in the little studio and underway, it felt less like a national broadcast and more like a friendly four way chat between the guests and the host, Melvyn Bragg, who brings his own authority and presence to the debate. We discussed the role of a queen in the fifteenth century, how Margaret came to be queen of England, and how her role changed when her husband, King Henry VI, collapsed, probably never to recover fully, how far she became the leader of the Lancastrian party, and how she tried to keep her husband on his throne, ensure the succession of her son, and the continuation of her own role as queen – and why she ultimately failed in these aims. Although I am not the biggest movie buff in the world, a sense of professional obligation led me to watch the recently released Netflix original ‘Outlaw King’. A film relating to Robert the Bruce, Anglo-Scottish warfare and late medieval views of war covers many of the topics that I get to teach at Winchester (e.g. the First English Empire to second year students, which is just about to get to Edward I, and a comparative study Chivalry which I teach to third year students). Outlaw King is by no means not be the best film ever made (though much better than its 1995 equivalent Braveheart) it did nevertheless throw up a few curiosities, which dovetail nicely with some lectures I am currently preparing. By this I’m not talking about some of the films inaccuracies (Edward II was never at the battle of Loudoun Hill for instance) but a few general perceptions of the period and those involved. The most impressive thing about Bruce is that his propaganda definitely lives on, particularly the murder of John Comyn, an act that was almost certainly premeditated. Surviving Scottish chronicles for the murder were all written several decades later with the benefit of knowing Bruce’s eventual victory, but even these written in the Scotland of Bruce’s descendants were all, to varying extents, uneasy about the killing. Indeed, there are so many narratives from both England and Scotland for this murder that we will never know the intricacies of what happened at Greyfriars in Dumfries. This gave the filmmakers a great deal of discretion in how they portrayed the event. It is therefore interesting that the version they presented – Comyn treacherously threatening to inform Edward I of Bruce’s desires to usurp and Bruce stabbing him in a fit of rage – is very much a Bruce version of events. Indeed, the film is very good at portraying Bruce as a patriot looking to help his kingdom; not the head of a noble house with royal ancestry staking a claim to the throne, which is what Bruce’s actions must have looked like to contemporaries given his propensity to switch side in the decade or so before his Road to Damascus moment. Edward II’s is also interesting, especially compared with the portrayal of him in Braveheart where he was portrayed as weak, somewhat effeminate, with many subtle hints about his sexuality that have not aged well over the past 23 years. The Edward II presented here is still unsure of himself but much more assertive and ill-tempered with no reference made to the king’s sexuality. Indeed, Edward II’s sexuality has been the source of speculation since his life. Again, whether Edward II was homosexual, bisexual or simply heterosexual but accused of homosexual desires simply as a way of further smearing his name (which is only found in chronicles in the three years following his death and then not again until the sixteenth century) is, once again, something unknowable and therefore gave the filmmakers some choices. They choose to avoid any comments on Edward II’s sexuality, giving the somewhat accurate portrayal of a bad-tempered, somewhat dislikeable individual, which certainly rings true of a man who twenty years later was deposed in a rebellion, in part headed by his estranged wife. Another effective aspect of the film is the manner in which it conveys the very small-scale nature of much medieval warfare: the film’s climatic battle at Loudoun Hill was a small-scale affair and it was a brave decision to end here as opposed to leaping seven years forward to the more famous, and larger, battle of Bannockburn. Medieval warfare was rarely about such set piece battles and Bruce’s objective of winning small skirmishes, burning castles and waging a guerrilla war come across effectively. Similarly, the brutal punishment meted out to traitors is presented in all its gore in this film, particularly the rather horrific (if historically inaccurate) killing of Robert’s younger brother Neil at the hands of Edward II – not for the squeamish to watch. War is portrayed as brutal and the film cannot be accused of glorifying warfare and for that it should be praised. One thing that did bug me a little, however, was the constant references to not fighting within the chivalric code. My assumption is that the scorched earth policies employed by both armies in the Wars of Independence is supposed to be presented as something that was alien to ideas of chivalry: the great theory of medieval warfare in which valiant opponents were offered the chance for honourable surrender in death. True, there was little evidence of this around this time, particularly in Edward I’s reactions to Bruce’s usurpation which was, even by Edward I’s high standards, and incredibly brutal affair. Yet, fourteenth-century kings and nobles were able to reconcile these ideals with the practicalities of waging war, particularly in relation to treason. The chivalric code allowed for such brutal as a means of punishing treason and rebellion, as rebels had forsaken the key chivalric duties. While we might view the way these wars were fought as being contrary to the chivalric code, I doubt contemporaries has such a distinction. Chivalry was simply too engrained in the worldview of the medieval nobility for any king or noble to say they were forgoing chivalry. This was not the film I was expecting to see. It’s not the best film at introducing who all these characters are (I got lost a few times and I teach this topic!). I expected to see the standard over the top film culminating at Bannockburn, a story which forgets the fact that it took a further 14 years, and numerous brutal raids into the north of England, to achieve peace. Looking at only the year or so either side of Bruce seizing the crown was an interesting way to go, and presumably leaves scope to make a follow on depending on popularity. In all, Outlaw King is a film worth watching that, if nothing else, made some interesting choices giving at least one historian something to think about. 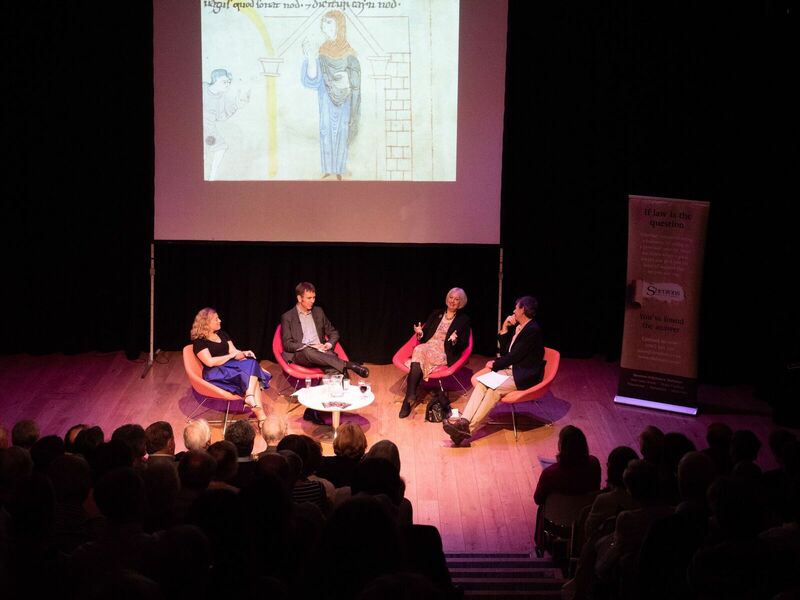 The launch of the 2018 Heritage Open Days in Winchester provided the opportunity for an evening of reflection between Winchester medievalists and the eminent historian and broadcaster, Professor Michael Wood. On the agenda were ‘Why do the Anglo-Saxons Matter?’ and ‘Extraordinary Women’. Michael Wood opened proceedings with his thoughts on the long legacy of the Anglo-Saxon world, its cultural richness and its diversity. Since his BBC series, In Search of the Dark Ages hit TV screens in the late 1970s and 1980s, Michael has held a reputation for making the deep past come alive to an audience, and this was certainly apparent in the discussion. Equipped with his own deep knowledge of the period, Michael asked us about what makes us passionate about this period, drawing down to how this links to our research specialisms—for Ryan this is the way the landscape beneath of feet links to a dramatic historical record; for Katherine this is the way the stories of the period are told and retold, helping form the identities of generations during the medieval period across what is sometimes wrongly seen as a ‘dividing moment’ in 1066. Linking with the Heritage Open Days’ theme of ‘Extraordinary Women’, we also nominated some favourites: Barbara suggested Æthelflæd, daughter of King Alfred and ruler of the midland kingdom of the Mercians until her death 1100 years ago in 918; Ryan ran through the twists and turns of the life of Emma of Normandy, who was married first to Æthelred ‘the Unready’ and later to Cnut ‘the Great’ (subject of Ryan’s new biography in the ‘Penguin Monarchs’ series), and who was the mother of two English kings in the 11th century; Katherine, whose interests in the ‘Anglo-Norman’ period will result soon in a new examination of the places of women and men in residences of the aristocracy, nominated one of the most important women of the 12th century, the ‘Empress’ Matilda, who drew on her links to the Anglo-Saxon royal family to emphasise her right to rule the English kingdom in a bloody civil war. Though we had been more than a little nervous about the prospect of ‘chatting’ in front of a packed house with such a learned and well-respected host and in the company of the wonderful Barbara Yorke, the evening proved to be relaxed and enjoyable. 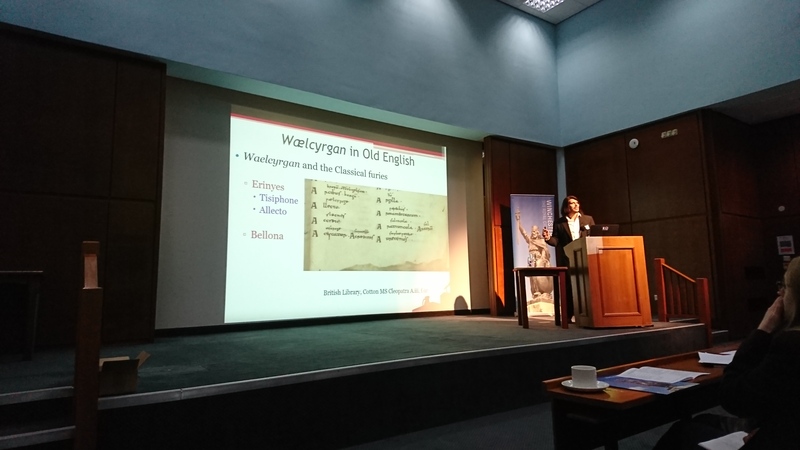 We received great feedback from the audience who had been entertained but who had, we are told, also learned much about an early medieval period of English history. We learned much too, both about ways of thinking about history itself, and about the ways in which an expert such as Michael can make even obscure details accessible and enjoyable beyond the academy. For many historians, one of the most enjoyable aspects of the profession is trawling through the archives finding hitherto undiscovered gems or re-examining well known documents in a new light. This is what our discipline is built on and for those of us lucky enough to teach the subject to a group of enthusiastic students the opportunity to allow them to see and handle the original documents themselves is always one to be taken. On 20 March 2018 two Winchester historians – Dr James Ross and Dr Gordon McKelvie – took a group of their final year Depth Study students who have spent the academic year studying the Wars of the Roses or the Hundred Years War on a trip to the National Archives. The visit introduced students to a range of archival sources relating to kingship, propaganda and money in their respective topics. The Depth Study is a year of intensive study on a particular historical topic relating to the lecture’s research expertise, which is a vital component of a B.A history degree. Like all of our field trips at Winchester, the trip was designed not merely as a nice ‘add-on’ but as a way of enhancing the learning experience of our students by employing additional methods beyond the traditional lecture. But you don’t need to just take our word for this. Three of the students who went on this field trip kindly agreed to provide a short testimony of their own experiences of the trip. “We recently visited The National Archives as part of our Hundred Years’ War module. A member of staff, Dr Sean Cunningham, gave us a brief talk about the types of documents available in the archives and how we can find, access and study them. This was both extremely useful and informative, but naturally the highlight of our trip was when we were then given access to a select group of documents. These ranged from indentures of military service, which detail the composition and wages of late medieval armies, to drawn-out records of law cases, of which few were ever solved. It was fantastic to be able to handle these documents (the parchment upon which most of them are written is far more durable than expected) and to see the signatures of important individuals who we have studied for several years. The thought of Duke Richard of York sitting down to sign the document you are holding is, at least for the medieval historian, a source of immense excitement. The department would like to thank Alex, Amy and Austin for contributing to our blog. The department would also like to thank Dr Sean Cunningham of The National Archives for helping to facilitate this trip and sharing his expertise with our students. I am coming to the end of my final year of studying History and the Medieval World at the University of Winchester. My overall experience of the degree has been an extremely positive one. I chose this course in particular because my main area of historical interest has always been the Middle Ages. However, the module choice for medieval students is not limited only to medieval topics. I have studied plenty of other periods such as Ancient Rome, British India and even Old English as a language. The course title guides the focus of your studies and what period your third year dissertation will cover, but it does not limit what modules you are able to study throughout. Tutors consistently provide informative and engaging lectures, while opening up the floor for discussion during seminars. I have yet to attend a lecture or seminar which has not both interested me and made me think thoroughly about the topic of discussion. Tutors have also regularly demonstrated that they are willing to go above and beyond to help their students. I have always received support and feedback when I need it. There have been plenty of educational experiences available. I have been able to study local Hampshire records, handle Saxon artefacts at the British Museum and most recently explored Hundred Years’ War documents at The National Archives. I highly recommend these enriching experiences to all medieval historians. Socially, there are plenty of clubs and societies which cater to various interests and hobbies, all the way from sports to politics. The History Society (don’t let the name deceive you) hosts great socials, including its infamous white shirt pub crawl at the start of each year. Cliché aside, it’s definitely true that you find your friends for life at university. The messing around in the flat, the nights out, the deadline stress – it all forges great friendships with people you would not have met otherwise. Having almost completed my time at Winchester, I know I will be able to look back on so many fond memories. The course, the city and the people here have all made this the best experience of my life, and I certainly feel ready for the future. [The History Department would like to thank Austin for agreeing to write this blog and his kind word]. 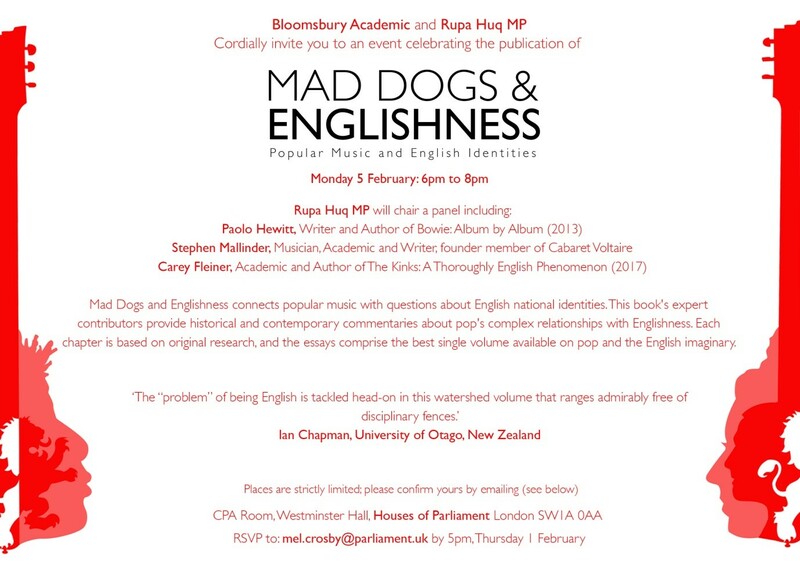 My chapter, ‘‘Rosy, Won’t You Please Come Home:’ Family, Home, and Cultural Identity in the Music of Ray Davies and the Kinks’’ (in Mark Donnelly, Lee Brooks and Richard Mills, eds., Mad Dogs and Englishness: Popular Music and English Identity. Bloomsbury Press. 2017 ) is the outcome of a similarly titled conference paper that I gave at St Mary’s University College, London, 21 June 2013, coincidentally Ray Davies’s birthday. An account of that conference is somewhere on the History Department blog (submitted in 2013). I checked to see if they wanted us speakers to have any opening statements or comments prepared, and was told, ‘Nope, you’re fine, just come along.’ Moments before we were herded to the table at the front of the room, Rupa took me to one side and said that after the introductions, she wanted me to take 15 minutes or so to introduce the book, its main themes, and a bit about my own contribution. I’m told what I said was erudite and witty, and that it set a good tone for the panel to launch with. It was a bit hectic to be put on the spot like that, but this was fairly mild in comparison to being told that an additional, last-minute addition had been made to the panel. My chapter was on the Kinks and how they were received and marketed as ‘English’ in both Britain and abroad; fortunately there was an actual Kink on the panel (the last minute addition) to confirm my assertions. 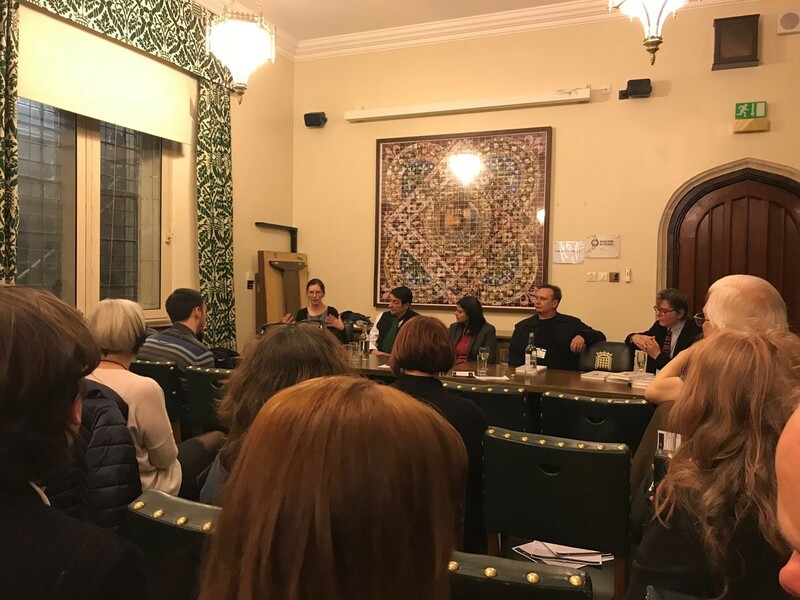 Much of the talk was dominated by Paolo Hewitt and Stephen Millinder, but during the milling about part afterwards, quite a number of women came up to speak to me about how the two women in the panel didn’t get much of a chance to speak. So it was a good opportunity to continue the conversation afterwards. Richard Mills, one of the editors, is a long-time colleague, and we discussed the possibility of a sequel: between the time we held the conference and the time of the book launch, Brexit, of course, happened – it and its subsequent impact have rendered a number of our chapters positively quaint. It would be nice to have a follow-up conference, maybe at Winchester this time around, if there is interest and pocket money to be found to help support it. This one shows Richard Mills making some closing statements. At the table, me on the far left; Bob Henrit of the Kinks on the far right. 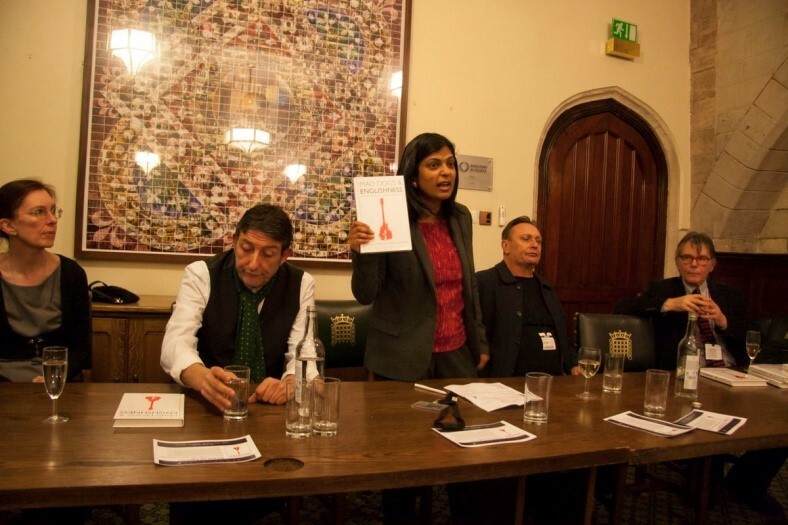 Picture by Richard Mills, me talking to lead off the proceedings. You can tell I’m saying good things because I’m making important hand gestures.